Daintree Valley Haven: A beautiful Sunday! What a lovely day it has been! Our guests were all out and about so we headed for a nearby beach for a long walk along the water's edge then to a local bistro for a light lunch and home to catch up reading our weekly newspaper (no deliveries here so we order the Weekend Australian from the Daintree Store for our weekend reading). 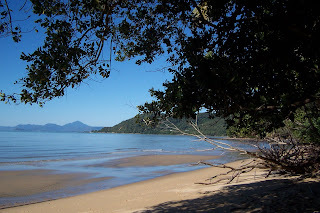 It reminded us again how lucky we are to live in Daintree with such a diverse range of destinations on our doorstep - rainforest, 'outback' Australia, farmland and fantastic beaches all within an hour's drive. And we shared our beautiful beach with (and I counted them) exactly twelve other people!